Innovation and partnerships are key to advancing the bio-economy in both Alberta and Canada. That was the message delivered by Alberta Innovates BioSolutions (AI Bio) Chief Executive Officer Dr. Stan Blade at the recent annual Canadian Bioenergy Association (CanBio) conference held in Edmonton. AI Bio co-hosted the three-day CanBio conference, which was focused on the theme of “Biomass in a Canadian Energy Strategy – Advancing the Bio-economy.” It attracted a large number of participants from the forestry, agriculture, energy, government, and research and development communities. AI Bio Chief Executive Officer Dr. Stan Blade (above) emphasized the need for bio-industries to partner with the conventional energy sector to develop bio-based products at the recent CanBio conference in Edmonton. In addition to the need for innovation, Blade emphasized the need for bio-industries to partner with the conventional energy sector to develop bio-based products to meet their needs and to co-operate on finding ways for bio-products to supplement products in the stream of conventional energy production. 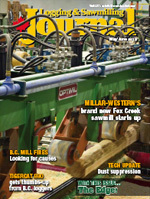 “We see the energy industry as a collaborator, as a cooperator, and as something that can be supported by the bio-economy,” he said, noting that there is opportunity within the province because Alberta’s biomass resource is significant, the province has a good handle on where it is located, and also on its availability. Dr. David Bressler, Executive Director of the AI Bio-supported, Bio-refining Conversions Network (BCN), agreed that Alberta’s approach of working with the non-renewable energy sector to find solutions within the bio-economy has been positive, and has opened doors to many opportunities “The entire non-renewable infrastructure we have in Alberta is actively looking for alternatives that are locally grown and help green their footprint,” he said, referring to diluents, lubricants, and surfactants that the industry commonly use in its extraction processes. He adds that BCN is building bridges by creating teams with different disciplines to work with industry partners to develop and commercialize technologies. Its role is also to help government review and validate the many bio-based technologies presented to it. 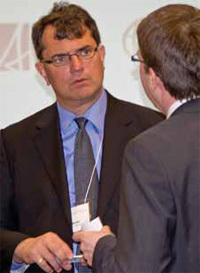 Doug Lammie, Acting Assistant Deputy Minister at the Alberta Department of Energy, noted during his keynote address that despite the province’s focus on fossil fuels, Alberta is the only province to collect a fee from large greenhouse gas emitters, which is then channeled toward research, development, and investment into greenhouse gas reduction and renewable energy initiatives. He said as part of its discussion with other provinces and the federal government toward development of a Canadian Energy Strategy, Alberta will emphasize the importance of involving traditional bio-industries. In his presentation focused on accelerating renewable energy deployment, Surindar Singh from Alberta Innovates Energy & Environmental Solutions pointed out that government support to encourage greater deployment of renewable energy technology is not a barrier. While there needs to be better harmonization of support programs between the federal and provincial governments, there are nonetheless a number of strong industry incentives for bio-energy and bio-product development. However, when looking at how industry is tapping into these incentives, he noted that there are plenty of industry subscribers for government programs offering grants, but lesser uptake from industry for programs offering repayable loans. Singh made a strong pitch for the need for continued support for research and development in the areas of bio-energy and bio-products to help maintain the momentum that will lead to further expansion of the bio-economy. “The key barrier (to accelerated deployment) is the need for breakthrough innovation,” he said. Another constraint is a secure raw material supply to industry. 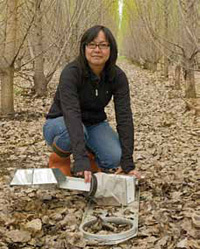 Dr. Carmela Aravelo (left) sets up an automatic carbon dioxide exchange system in an eight-year-old stand of hybrid poplar to collect the data to measure how much carbon at the Ellerslie demonstration site is being sequestered. Those are the three most popular questions that the Canadian Wood Fibre Centre (CWFC) gets when they offer tours through the Ellerslie Short-rotation Woody Crop Technical Development Centre and demonstration site in Edmonton, Alberta for landowners, forestry personnel, researchers and potential investors, says CWFC Wood Fibre Development Specialist Tim Keddy. Established in 2002, the 18 hectare site leased from the University of Alberta was the first of over 150 technical development sites now established and monitored by CWFC in various geo-climatic zones across Canada. It was the template CWFC used to establish sites that demonstrate different species, clones and plantation management regimes. The Ellerslie site has test plots featuring hybrid and clonal aspen, hybrid poplar, mixed wood, and willow under high yield afforestation and concentrated biomass regimes. For comparison and study purposes, so do the many other development sites managed by CWFC across Canada. Based on the health of the wood fibre and growth achieved on each site, CWFC can recommend to landowners what species are the best bets as a cash crop for their particular area. For example, visitors to the Ellerslie site see healthy short rotation willow, hybrid poplar and hybrid aspen crops often showing exceptional growth planted right next to species that are struggling. Conversely, a CWFC technical development site in southern Manitoba or Ontario in a different soil classification, climate and precipitation zone could show the exact opposite growth pattern. That’s the value to landowners and investors of having so many development and demonstration sites throughout Canada. And it all started with Ellerslie in 2002. CWFC has also established mixed wood trials at the Ellerslie location where hybrid poplar and white spruce are planted together. The concept shows how landowners can harvest two valuable crops from the same land base, with the poplar being harvested after 20 years and then the spruce left to grow to full maturity and then harvested after about 60 years. With two crops maturing at different times, the site also operates longer as a valuable carbon sink. However, technical development and demonstrations sites like Ellerslie do much more than demonstrate growth and yields of various tree hybrids and clones. They also demonstrate different refined plantation management regimes that landowners can replicate to achieve the highest possible yield over each growth cycle for either high yielding trees or short rotation woody fibre. In addition to selecting the right tree variety for a particular area, spacing, the number of stems planted per hectare, mortality management, and vegetation management until crown closure are important considerations for a successful plantation. CWFC has already completed a lot of the critical management regime experimentation on its technical development sites to be able to make management recommendations to landowners regardless of where the fibre is being grown. Visitors to the sites can see the results for themselves. “The whole goal is to create regimes that grow the most amount of biomass for the cheapest cost,” says Keddy. Short rotation woody crops also offer a potential source of carbon sequestration, which can generate income for landowners through the sale of carbon credits. CWFC has partnered with the Canadian Forest Service (CFS) Climate Change Group to evaluate how much carbon is being sequestered on the Ellerslie site and on other development sites to determine: whether the plantations are a carbon source or a carbon sink; when the plantations make the transition from becoming a carbon source to a carbon sink in different soil classifications and geo-climatic zones; and how CWFC’s management regimes influence carbon sequestration capacity. Working with CFS researchers, Arevalo is conducting studies on many CWFC development sites to quantify carbon inputs and outputs, and the carbon credits that the various plantations and management regimes will produce. “I imagine that that stakeholders will benefit in terms of the carbon gain that they achieve,” says Arevalo.